On the evening of 7 December 2016, the Chinese Ambassador to the UK H.E. Liu Xiaoming attended the final of Pitch@Palace Global at St James' Palace, London. 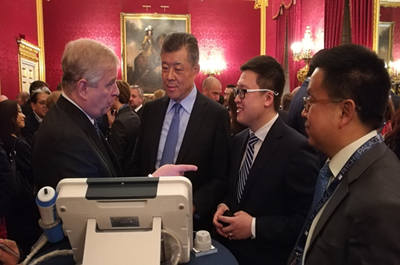 At the event, Ambassador Liu exchanged views with HRH the Duke of York, founder of Pitch@Palace, on China-UK relations and innovative business in China, and listened to the presentation of the finalist Hisky Medical, a Chinese enterprise, about its R&D process and application prospect. Ambassador Liu encouraged Chinese enterprises to continue focusing on innovation, expanding their market in the UK and pushing forward the development of their projects. Pitch@Palace, a startup and investment platform established by HRH The Duke of York in 2014, is committed to gathering influential global leaders in various areas and providing startup businesses with quality environment and resources. In the past three years, the initiative has helped hundreds of startups around the world, some of which have now been purchased by Apple, Tweeter and other world renowned enterprises, and raised over 240 million pounds of investment. On 26 October 2016, The Duke of York attended the launch of this platform in Beijing, China. Twelve startups from China, Australia, South Africa, Mexico and other countries were selected for this final of Pitch@Palace Global.